brought his black servant "Dave" and his wife "Ann" to Vicksburg, and intends to take them with him to his house, he also stated that he had settled with "Dave" by paying him $5.00 cash yesterday. The Steamer "City of Alton" left at noon, with Lts. Mayer and Kranz on board. I got my business arranged and left the city about 4 P.M. exceedingly glad to do so, since it was a punishment for me to remain in it, the heat, and dust were almost intolerable. Travelled along on mules very pleasantly. Stopped at Mr. Bolin's a little after dark, and took supper. Reached camp at 11 P.M. Wednesday 12. 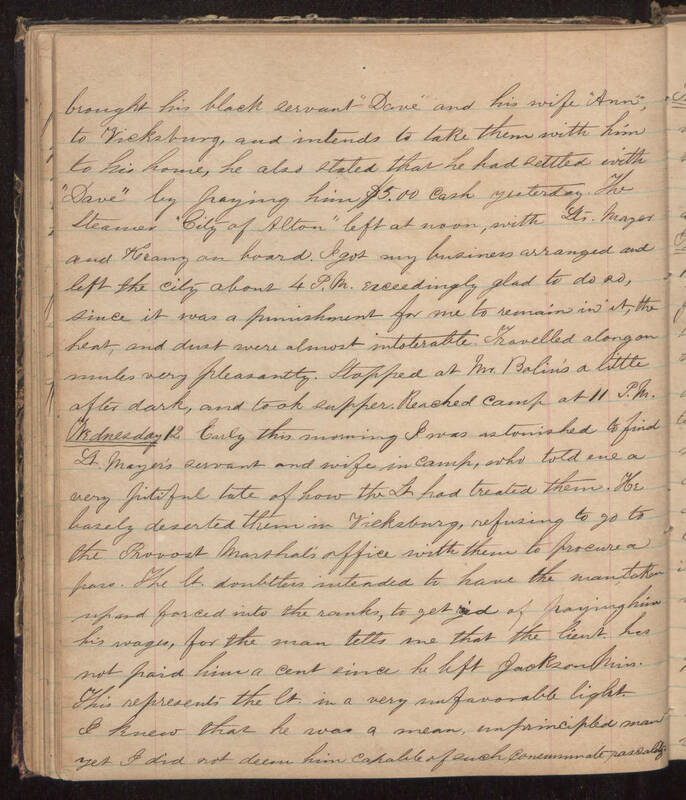 Early this morning I was astonished to find Lt. Mayer's servant and wife in camp, who told me a very pitiful tale of how the Lt had treated them. He basely deserted them in Vicksburg, refusing to go to the Provost Marshal's office with them to procure a pass. The lt doubtless intended to have the man taken up and forced into the ranks, to get rid of paying him his wages, for the man tells me that the lieut. has not paid him a cent since he left Jackson Miss. This represents the lt. in a very unfavorable light. I knew that he was a mean, unprincipled man yet I did not deem him capable of such consummate rascality.